At the time I promised to do another simular mini-course for bras with larger cups. Well, the Mini-Course Large Cup Bras is finally finished and now available in the Merckwaerdigh shop on platform Etsy! At first glance it might look almost the same as the previous bra mini-course but that’s just the lay-out. For larger cups there certainly are some differences in what to watch out for! If you don’t know anything about the previous mini-course I can imagine you wonder what on earth is a MINI-COURSE? A sneak preview video on the Merckwaerdigh Facebook page will give a short impression what to expect. For starters you don’t have to do all the hard work of drafting a basic pattern all by yourself. Every mini-course includes a MASTER pattern in several standard sizes, for this mini-course these are all the large cup sizes on the cover page above. But even when your size is not included in the MASTER pattern this mini-course could be very helpfull. Most of all the information can be used for any other large cup bra pattern you already might have! First step is to check the right size by sewing a test bra. You learn how to determine the right size for you which is always kind of a challenge. Most women are not really sure which size they need and what the numbers and letters in a bra size stand for. Well, the numbers relate to the length of the band and the letters relate to the cup size. But to make things more complicated, the letters are not a fixed mass! You can check for yourself in any shop; pick up a bra 32C and compare it to a bra 52C which cup will be at least twice as big … The pages in the mini-course about ‘sister cups’ will probably clarify this mystery. 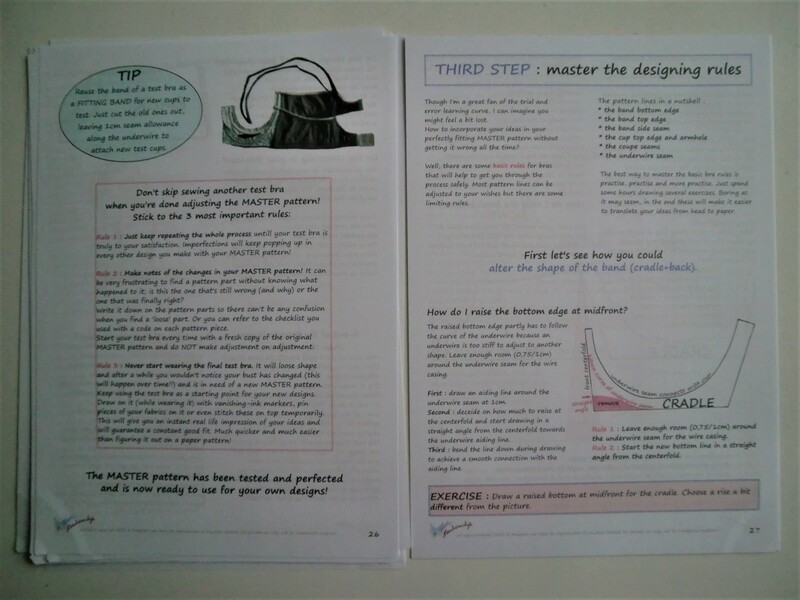 There are also pages full of information what kind of fabric, elastic and stitching to choose. The mini-course will step-by-step walk you through the whole sewing process with lots of illustrations in addition to the text. You can do it! Second step is not just to check the right size but also the right fit for YOU. The included BRA FITTING CHECKLIST will help you what to do when it’s not completey perfect yet. Some time ago I’ve written a bra fitting checklist blog about this with a link to the FREE printable checklist. You can also use the checklist for any bra, even the ones you bought in a store! A great way as well to discover why one bra is your favourite while another in the same size you are never really happy wearing. When you’ve determined the flaws in your test bra this mini-course will help to fix them with easy to follow illustrated instructions for the changes to the MASTER pattern. Just keep repeating the process untill your test bra is truly to your satisfaction. Imperfections will keep popping up in every bra you make from this MASTER pattern, even when using it for a new design! Once the test bra is a perfect fit you keep it just the way it is. Don’t start wearing the test bra but use it to mark your new designs with a vanishing marker (the ink vanishes by itself through light) while you’ve put it on. All you have to do is copy the marker lines on your personal MASTER pattern, which is way easier than figuring it all out on paper. Third step is about altering the MASTER pattern for another design you’ve seen somewhere or thought up yourself. Before you go wild with all the designs in your head there are some designing rules you need to know. What’s the maximum drop or raise for the bra bottom and top edge, that kind of thing. You’ll even learn how to incorporate a POWERBAR! Every design alteration comes with some rules, do take these seriously! No need to find out the hard way why that rule is written down … just benefit from my long years of experience (since 1990!). The mini-course includes a lot of illustrated designing information and also exercises because it is a course after all! Don’t skip these exersizes, some basic experience will make it much easier to get your own designs right. 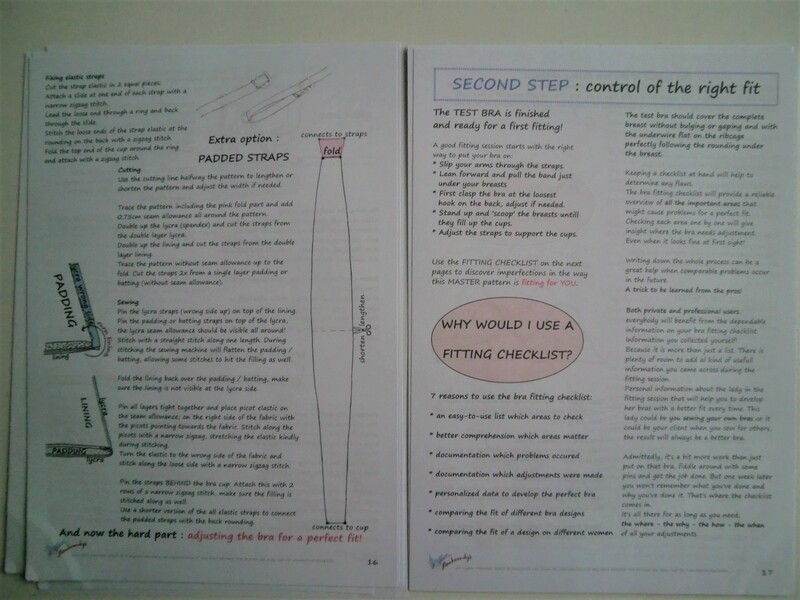 This entry was posted in mini-courses and tagged bra designing course, bra fitting checklist, bra making, bra pattern course, design your own bra, DIY bras, good fitting bra, how to design a bra, large bra cups, large bra design, Merckwaerdigh course, modern bras. Bookmark the permalink.